During his lifetime, Alberto Giacometti declined numerous requests to display his work at the Swiss Pavilion of the Venice Biennale, which was built by his brother, renowned architect Bruno Giacometti. In 2017, the Swiss Pavilion will recognize the contributions of the enigmatic artist with Women of Venice, an exhibition curated by Philipp Kaiser with new works by Austin-based artistic duo Teresa Hubbard / Alexander Birchler and Geneva-born, Brooklyn-based sculptor Carol Bove. 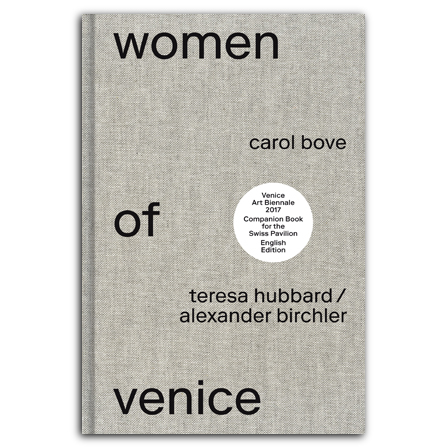 With sixty color illustrations, Women of Venice documents the planning and creation of the ambitious Swiss Pavilion at this year’s Biennale. The pavilion will explore Giacometti’s legacy while also reflecting on the history of Switzerland’s past contributions from a contemporary perspective, taking account of concepts like national identity and cultural policy. All three artists have created new works specific to the context, making this book a captivating look at the most recent work by these important artists, as well as a record of this historic event.